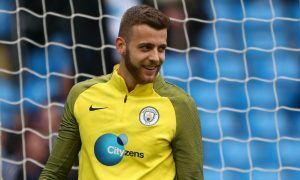 Manchester City goalkeeper Angus Gunn is fast emerging as one of England’s best young shot-stoppers after a string of impressive displays on loan at Norwich City and a spot in England’s under-21 side. The 21-year-old started his career at Norwich before moving to the City academy in 2011, where he rose through the ranks before reaching the first-team squad. He has yet to make an appearance for Pep Guardiola’s side, but was named on the substitutes bench a number of times last season. This season he is enjoying his first loan away from the Etihad Stadium with a return to Norwich, and this is turning into a very successful spell for the youngster. Though Norwich are only 10th in the Championship, Gunn has been impressive and has just broken a record. For the first time in Norwich City history, the club have kept five consecutive league clean sheets with Angus between the sticks. The Canaries have won three and drawn two of their last five league games without conceding a goal (1-0, 0-0, 1-0, 0-0, 1-0). The signs are good for Angus, although with the excellent Ederson now at Manchester City, it remains to be seen if the England youth international will be at the Etihad long-term or seek a club where he is guaranteed weekly football.